Successfully Added Car Bluetooth Clip On Rearview Mirror with SD + USB Port to your Shopping Cart. Smart, safe, and effective, this Car Bluetooth Clip On Rearview Mirror with SD + USB Port allows you to keep your eyes on the road while making and receiving calls. Simply snap it over your existing rear view mirror and you are ready to hit the road! For a safer drive, this Bluetooth Rearview Mirror offers convenient hands-free calling that can be set up instantly. 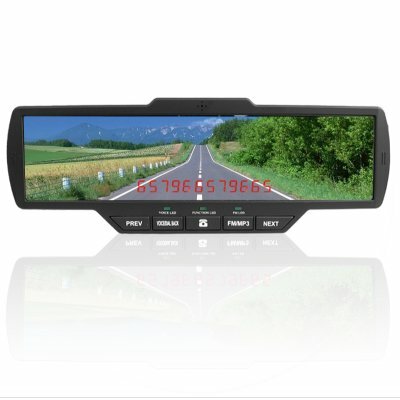 Simply clip this car accessory over your current rearview mirror and connect it to your phone through Bluetooth and the built-in LCD will display the number of any incoming callers! In addition, one-touch buttons are available for voice dialing, redial, call back, and rejecting calls - making calling in your car safer than ever before. This Bluetooth Rearview Mirror also adopts the latest in noise and echo-free technology and includes two powerful built-in speakers for amazing audio enjoyment in the car. Users can insert a USB flash drive or SD/MMC card for directly playing music, or even use the FM transmitter for listening from your car's own audio system. Better yet, use the wireless earphone for private music listening and phone calls! High quality at a factory-direct price, this Car Bluetooth Clip On Rearview Mirror with SD + USB Port is the perfect car accessory to not only to improve the safety of you and your passengers, but also to enhance your audio enjoyment. Available in our warehouse now, order today and we will express ship it tomorrow, guaranteed! Brought to you by the leader in wholesale electronics and car accessories - Chinavasion. No, only the incoming number. This Car Bluetooth Clip On Rearview Mirror with SD + USB Port works great! I ordered from Nigeria and got my stuff quicker than promised and all my friends are going WOW! for it. Cool! really cool! on 2009-07-03 03:35:56 Top item. Good working.